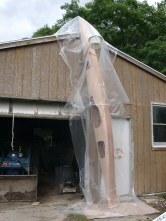 Now it is really starting to look like a boat! It was time for the end pours which means that you pour about 6 oz. 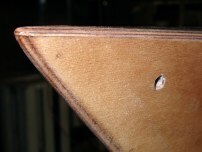 of thickened epoxy into the bow and stern both to strengthen them and so that you can drill through them to install loops of line for easier carrying. After the above picture was taken, I decided it was a better idea to roll it over 180 degrees so that the deck side was leaning inward. This would make the epoxy run toward the top of the stern which is where I want the grab-loop to go. I poured in the epoxy and also did two of the four fillets where the bulkheads join the deck. Then due to the threat of rain I covered it in tarps. Why didn't I wait until there was no rain in the forecast? Because I am on a tight schedule and can't miss another day of drying time. 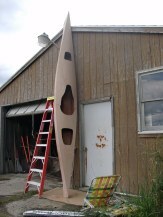 After the stern pour was dry, I flipped it over and did the bow plus the other two bulkhead fillets. Once both ends were dry, I drilled a 3/8th" hole for the grab loops. I set them in a little from the very tips of the boat so that the grab loops will not be able to flip down and drag in the water.